An Indian woman from the village of Barsana hits villagers from Nandgaon with a wooden stick during the Lathmar Holi festival on March 21, 2013. In a Holi tradition unique to India’s Barsana and Nandgaon villages, men sing provocative songs to gain the attention of women, who then “beat” them with bamboo sticks called “lathis”. 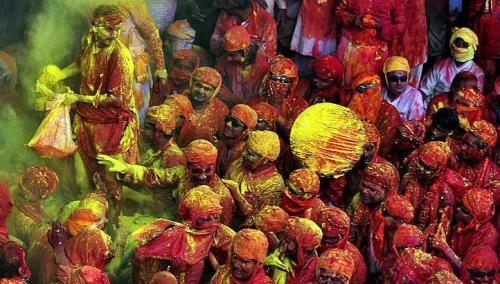 Holi, also known as the Festival of Colours, heralds the beginning of spring and is celebrated all over India. 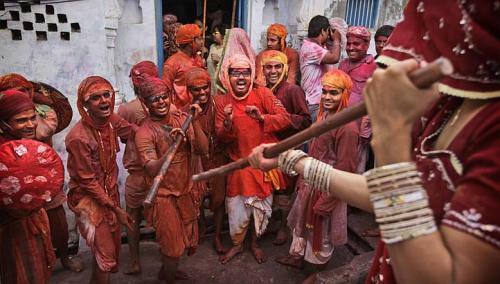 In a Holi tradition unique to India’s Barsana and Nandgaon villages, men sing provocative songs to gain the attention of women, who then “beat” them with bamboo sticks called “lathis”. Holi, also known as the Festival of Colours, heralds the beginning of spring and is celebrated all over India.